Today's post comes from Lauren Clark, author of Stardust Summer, through ABG Reads Book Tours. Welcome, Lauren! 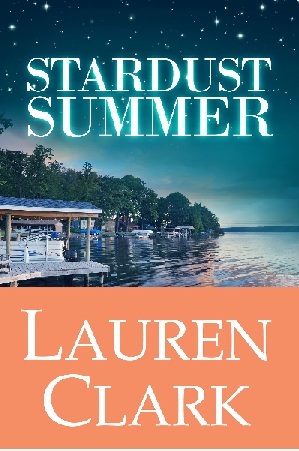 The title of Stardust Summer is meant to conjure up warm thoughts about spending the day at the beach or on the shores of your favorite lake or river. It's the sort of day spent in a bikini, barefoot, laughing with a group of your best friends. The grill's fired up, the sun's getting low in the afternoon sky, and all of your favorite songs are playing on the radio. What exactly would make the day just a little more perfect? A fun and flirty cocktail might taste refreshing after swimming and waterskiing. I'm talking about something tall and very cool rather than cozy. Nothing too sweet, with lots of ice, and a few bubbles too, to keep it fresh and zesty. 1 tsp confectioners' sugar. Shake for 30 seconds and pour through a strainer. Add a twist of lemon zest for garnish. 2. June Bug - Blend together 3 cups of Ginger Ale, 4 tablespoons of grenadine, 4 tablespoons of orange juice, and 3 scoops of orange sherbet. Serves 4. Add a splash of white rum for the "adult" version. 4. Electric Lemonade - YUMMY and refreshing!! Blend together 1 cup of fresh squeezed lemon juice, 1/3 cup of sugar, 1/2 cup fresh mint leaves, 1 cup sparkling mineral water, dash ginger ale, 1 cup of vodka, and 2 cups of ice. Garnish with mint and thin lemon slices. 5. Hurricane - Perfect for parties. Add Passion Fruit Cocktail mix, lemon juice, dark rum to crushed ice. Decorate with orange slices and cherries. 6. Alabama Slammer - Okay, so Stardust Summer is set in Mississippi and New York....but this drink is too simple and delicious to skip over for this Top Ten Drink List! Just mix up 1 1/3 ounces of chilled Absolut Vodka in a glass and fill with ice-cold cranberry juice. 3/4 ounce honey syrup, and 2 ounces Tequila. Mix the ginger and lemon juice. Pour into a shaker filled with ice. Add tequila and honey syrup. Shake well and pour into the martini glass. 8. Gin Fizz - This takes some work, but is tasty and fun to drink! Combine 1 tbsp. powdered sugar, 1/2 tsp. lime juice, 1/2 tsp. lemon juice, 2 drops orange flower water, and 1 egg white. Add: 1 whiskey glass sweet gin, 2 whiskey glasses of cream, and 2 whiskey glasses seltzer water, plus 1/2 a glass of crushed ice. Shake, strain, and drink. 9. Sangria - A traditional favorite that almost everyone will love. You'll need 1 bottle of white wine or blush Chablis, 1 two-liter bottle of club soda, 2 cups sugar, 3 oranges, thinly sliced, and 3 lemons, thinly sliced. Wash and slice the oranges and lemons. Discard seeds. Combine all ingredients (including lemon and orange juices) in a large container. Cover with plastic wrap and refrigerate overnight. Serve over ice. 10. Pisco Sour - Delicious and so pretty in a glass! Mix up 1 cup Pisco (a South American brandy) or White Rum, 1 cup guava nectar, 2 TSP superfine sugar, 1/4 cup lime juice, with a splash of bitters. Add lime slices and mint leaves. What is your favorite summertime drink? I'd love for you to share your recipe for the perfect afternoon cooler! A former TV news anchor, Lauren adores flavored coffee, local book stores, and anywhere she can stick her toes in the sand. Her big loves are her family, paying it forward, and true-blue friends. Check out her website at www.laurenclarkbooks.com.